Planning to hold an unforgettable pizza party in your patio? 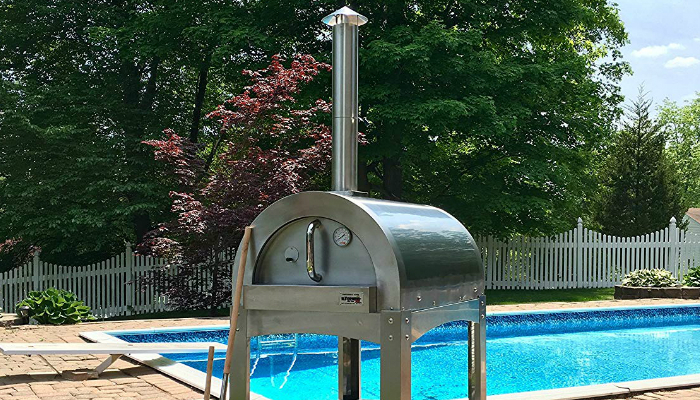 Wow your guests with the best outdoor pizza oven for home use. Waiting for warm, scrumptious pizza can make you lose your marbles if you have to wait for 30 minutes or so with an empty stomach. That’s why we highly recommend Pizzacraft PizzaQue PC6500 Pizza Oven. It can preheat up to 700 degrees Fahrenheit in just 15 minutes – and cook pizza in only six minutes! Why is this product unbelievably efficient, anyway? Its lid has an edgy dome shape to ensure that heat keeps on returning into the pizza. That’s crucial for faster cooking. 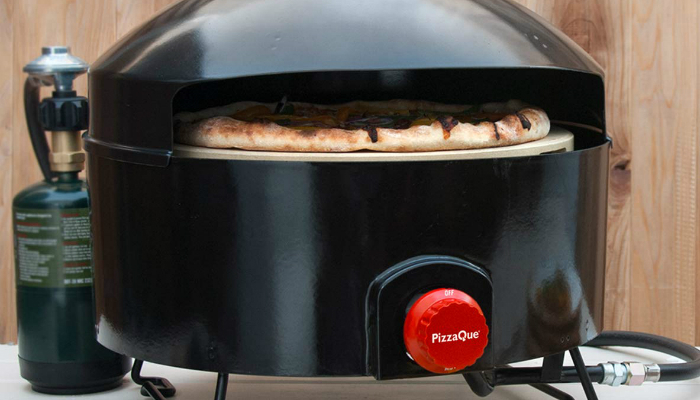 More importantly, this outdoor oven can make a perfectly cooked pizza. 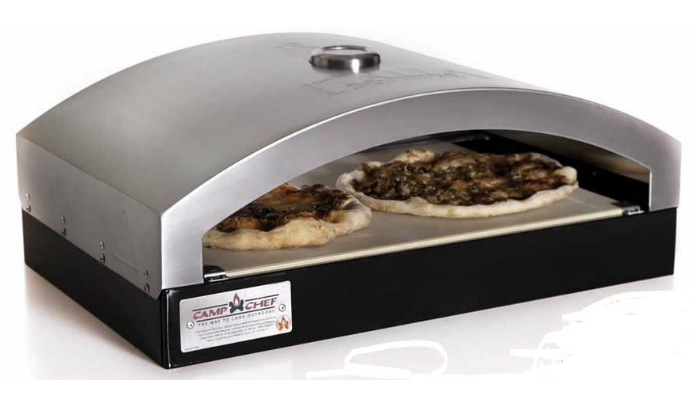 It comes with a 14-inch heat-diffusing pizza stone to evenly cook the crust. It can even keep the crust crispy or fluffy by releasing excess moisture through the vent. As a plus, this product has a built-in thermometer. That means no more excuses for an undercooked or overcooked pizza. Since convenience is also an important factor, this oven is very portable. 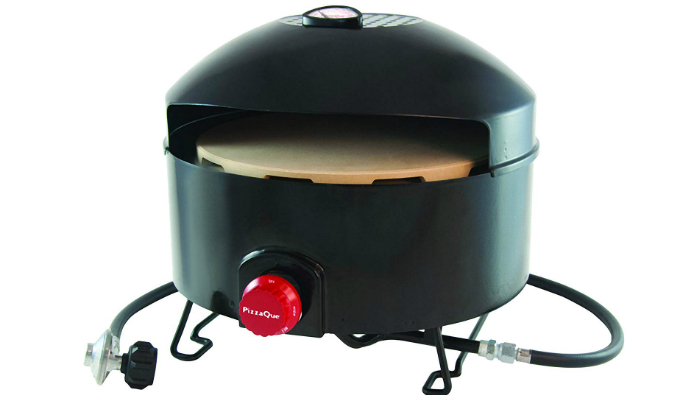 It has a lightweight structure and a sturdy base, perfect for cooking pizza anywhere you go. If you already have an 18.5- or 22.5-inch grill at home, transform it into a pizza oven with Kettle Pizza KPB-22 Basic Oven Kit. Having multiple cooking stations in the backyard can be exhausting to maintain, so it can be handy to use a makeshift oven. Besides, it works well with hardwood and charcoal, which proves its purpose. To ensure that heat won’t fluctuate, this product has a fixed opening where you can access the pizza anytime. Consistent temperature is crucial to make the perfect pizza. Don’t worry about the stainless steel material of this temporary oven. It is specifically made of 20 gauge, 304-grade steel. The aluminum pan is also safe to use. If ever you have to remove the oven right after cooking, it has handles for portability and safety. Taking quality up a notch, ilFornino Professional Series Pizza Oven is made of 430 stainless steel with a much thicker gauge. It also has two insulation-layered ceramic blankets within the steel dome and a bonus ceramic layer. 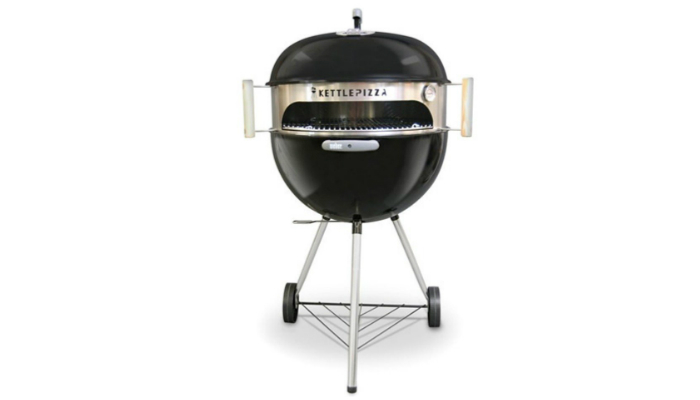 The entire design guarantees stronger insulation – five times more than a basic pizza oven. This product obviously falls short on portability, but its size will make it easier for you to cook multiple pizzas in just one go. If not quantity, you can definitely choose to make a really big pizza without any hassle. Looking for something more stylish? 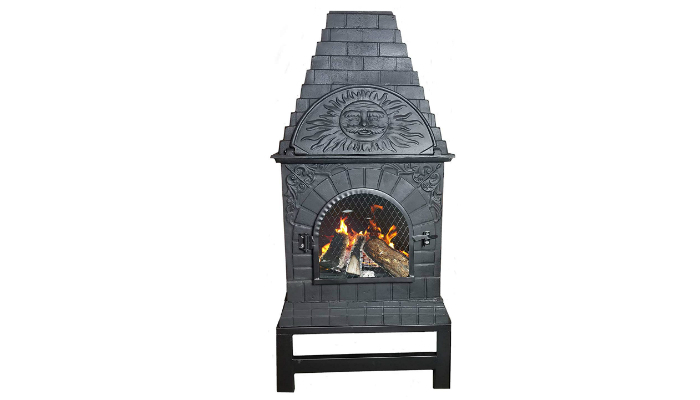 Don’t hesitate to choose The Blue Rooster Cast Iron Chiminea. It is elegant yet heavy-duty. To be more specific, this unique pizza oven is made of cast iron. Aside from the obvious benefit which is better heat retention, cast iron has a classic look. 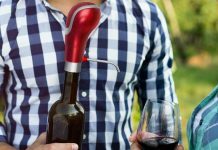 The best part about this product, however, is its multipurpose feature. It can serve as a fireplace to keep people warm and, at the same time, cook delicious pizza. If ever there are children nearby, the fireplace has a mouth screen to prevent direct contact with the flame and hot coals. Meanwhile, when it rains, the structure remains functional because of its special protective lid. The design seems intimidating, but it can make your life so much easier especially when it gets cold outside. It can boost the flames quickly without producing too much smoke. When it comes to cleaning, its surfaces are easy to maintain. Despite its modern look, Camp Chef Artisan Pizza Oven still works like the classic brick type. It has an open face for easier access without affecting the temperature. If you like your pizza soft and fluffy, this product is an excellent choice. Its ceramic stone removes excess moisture while keeping the crust moist enough for added softness. Using temporary pizza ovens is super-easy. Just install them on grills or stoves and start making fire like what you always do when you cook outdoors. Make sure the pizza oven is off. Check if the chimney is unobstructed. Remove the rain cover if it’s still installed. Open the valve for the liquid propane (LP) gas tank. Press the knob as you turn it to the left until it reaches the high setting with a click. Repeat Step 5 quickly for five seconds until the pizza oven lights up. Close the tank valve after use. If Step 6 doesn’t work, turn the knob in the opposite direction until the pizza oven is off again. Repeat the step after five minutes. If the burner still fails to work, turn off the gas. Wait for five minutes to ensure there’s no excess gas left. Troubleshoot the pizza oven if you really can’t ignite the burner. Read the user’s manual. If the burner suddenly turns off while cooking the pizza, go back to Step 1 and repeat everything. Wear heat-resistant gloves when handling a hot pizza oven. Don’t lean too much on the burner to avoid exposing your face to danger. Only use the pizza oven outdoors. Regularly do a maintenance check to easily spot damage on the hose. Don’t place the hose near hot surfaces, especially under the oven. Place the pizza oven on a flat, stable surface. 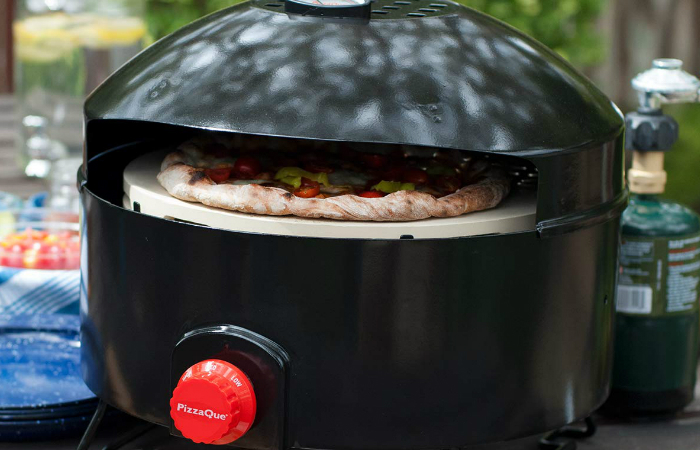 We believe that the best outdoor pizza oven for home use should be portable. That’s why we selected Pizzacraft PizzaQue PC6500 Pizza Oven for the top spot. If you’re not used to operating grills, you really should consider this type of oven which relies on a gas burner instead. Just because you’re camping doesn’t mean you can’t enjoy the benefits of cooking in an oven. Start learning how to use a Dutch oven while camping. You can even bake bread in it! Meanwhile, a pizza can either be very nutritious or unhealthy. Find out what kind of vegan pizza is packed with protein to speed up muscle recovery. On the other hand, there’s a type of pizza nutritionists won’t eat.